Kansas City, Mo. 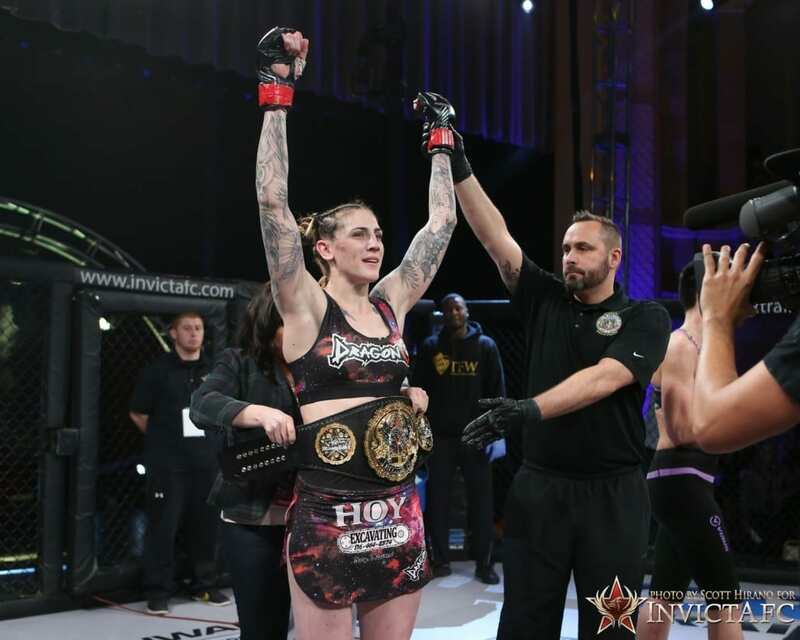 — On Saturday, Jan. 14, Invicta Fighting Championships hosted Invicta FC 21: Anderson vs. Tweet from the historic Scottish Rite Temple. The event streamed live and exclusively on UFC Fight Pass beginning at 8 p.m. ET. 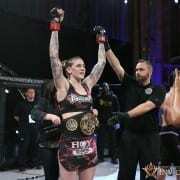 Australia’s Megan Anderson is the interim featherweight champion after her second-round TKO finish of veteran Charmaine Tweet. The two towering fighters wasted little time throwing heavy punches. Tweet clipped Anderson with a right hand that saw the Aussie wobble briefly. Anderson remained calm and continued her forward pressure. Tweet found herself with her back against the fence and Anderson scored with combinations. Late in the opening round, Anderson scored with a big slam. Round two began with a big exchange and Anderson took the fight to the fence. She unloaded on her Canadian foe, forcing Tweet to retreat. Anderson delivered a head kick and Tweet covered up, forcing the referee to intervene and stop the title tilt. Hawaii’s Raquel Pa’aluhi made short work of former No. 1 contender Pannie Kianzad, earning a first-round submission win. After both fighters landed kicks, Pa’aluhi latched onto a single-leg takedown to put Kianzad on her back. Pa’aluhi worked patiently from the top before taking Kianzad’s back. Once there, she softened up the Swede with punches to lock in the fight-finishing rear-naked choke. 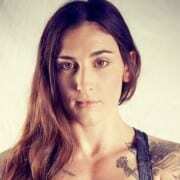 Newcomer Leah Letson gave UFC veteran Elizabeth Phillips a rude welcome to the Invicta cage. Phillips scored with an overhand right early, but as she circled along the fence, Letson unleashed a left head kick that caught her flush on the chin. Phillips crashed to the mat and Letson finished her off with punches. 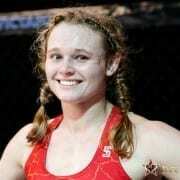 Two of the bantamweight division’s most promising fighters went to battle for three rounds with Aspen Ladd remaining undefeated by unanimous decision over Sijara Eubanks. Ladd fired jab-cross combinations throughout the opening round, but Eubanks was able to score with a late slam. The middle stanza saw both fighters score on the feet, but Ladd’s volume outpaced Eubanks. Ladd opened round three with a takedown, but Eubanks was able to reverse the position late. It was too little, too late for Eubanks, however as Ladd claimed victory. Andrea Lee got back in the win column, needing just 74 seconds to stop fellow flyweight Jenny Liou. Lee pressured Liou from the opening bell, backing her up with punches. Liou tried to circle away, but Lee got her against the cage and delivered a heavy body shot that sent Liou to the canvas. Lee flurried and forced the referee to halt the contest. Strawweights Amy Montenegro and Celine Haga put on one of the greatest fights in Invicta history with a back-and-forth battle. Haga was able to threaten Montenegro with multiple submissions in the opening round, but Montenegro countered with an armbar late in the round. Haga tapped, but it was after the bell had sounded. Round two saw Montenegro quickly gain top position and pound on Haga with elbows. Montenegro worked to top position again in round three, but it was Haga who attacked aggressively from her back. As time expired, Haga applied a schoolyard choke and Montenegro went unconscious, but it was after time expired. When the scorecards were read, Montenegro walked away with the decision win. In her professional MMA debut, Muay Thai specialist Christine Ferea showcased her striking prowess against Hawaii’s Rachael Ostovich. Ferea scored at range early in the fight, but Ostovich turned the tide in round two by scoring a takedown and threatening to submit Ferea. In the final round, Ferea caught Ostovich with a clean head kick. Ostovich dove for another takedown, but Ferea smelled blood and flurried for the finish. Hell Yes, Shawn. And that smile on your smokin’ face puts a bigger one on mine.